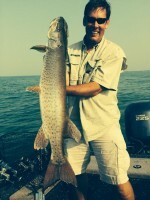 Chip Porter spent much of his adult life as a Professional Fisherman. For 12 years he had a popular radio show here in Chicago on The Score, Sportsradio 670, along with filming TV and DVDS, Magazines, Tournaments, Seminars and Personal Appearances.. Having towed a boat all over North America with trucks and being around them his whole life, it’s just natural that Chip should start Chips Trucks. Married for over 30 years his 2 sons are also partners in Chips Trucks. While Kirk is serving overseas as a US Army Capt, Erik is a Firefighter/Paramedic in the Chicagoland area.